Shell Creek Game Calls now takes credit cards over the phone! This stake is used for field hunting with motorized decoys. 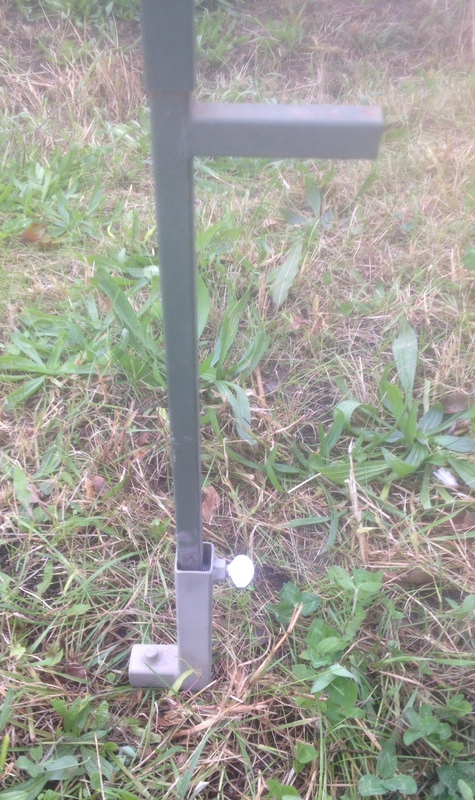 A simple and effective way to stake any motorized decoy. Push in by hand in tilled farm ground or drive into frozen,Rocky Ground, even Ice! A thumbscrew tightens to stop any rattle. Sold as 1 dozen per unit. Each Dozen comes with Carabineer Clip. The lines in these kits are 4 ft long. LONGER LINES AVAILABLE; CONTACT US FOR SPECIAL LENGTHS. Texas rigging is the easiest way to handle your decoys both in the field and in storage. These lines will not	tangle. When you set up take them off the clip and give them a toss. When picking up simply snap the loops on the clip as you go. No	winding lines!! These kits are ready to be installed with your weights. Simply run line through the Keel of your decoy, add	Crimping Sleeve then the weight, and run the string back through the Crimping Sleeve. Smash or Crimp sleeve on line and you are set. This mount is perfect for attaching your bottle style reels to your compound	bow. The mount attaches to your bow riser at the universally spaced sight	mount holes. The mount is attached to the bow riser by two countersunk	Stainless steel flathead bolts. The bracket of your reel covers the two	flathead bolts to assure they cannot back out and loosen. Four Cap Screws	attach the reel bracket to the mount. These four screws offer a up and down	adjustment for proper trigger alignment. The height of the mount gives	needed clearance on the backside of the bow riser for several types of arrow	rests. An attractive and strong mount machined from 6061 aluminum. We think you will enjoy our product. The mount comes in two heights, 3/4" Tall and 1"	Tall. Please specify when ordering which height mount you need for your	application. Note that picture shows 2 mounts for the purpose of 2 views of product. Included in package are one mount and all needed hardware.